Jonathan Page and his family before the start of the race. A few years ago I picked up a copy of Behind The Stare by Geoff Proctor. Being a sports fan, with little cyclocross knowledge outside of the Utah Cyclocross Series (UTCX), I was fascinated with the Euro-Cross scene depicted in this book. When I finished the book I put a Belgian cross race on my bucket list. A few summers later I had the pleasure of meeting Cori and Jonathan Page (Utah resident and professional cyclocross racer) at my favorite cycling event in Utah: The Huntsman 140. I had heard that the Pages had move to Kamas so when I saw Cori I introduced myself. As a mother, I was curious as to how she and her kids were adjusting to Utah as I had done so 10 years before at the same age with young children. From that day on, a friendship grew between us. Now that I had gotten to know, Jonathan (“JP”), I became a fan and followed his races via the web. My first pro race I attended was Cross Vegas in 2013 and I was immediately hooked after seeing the athleticism and fitness that exists in Cross at the elite level. 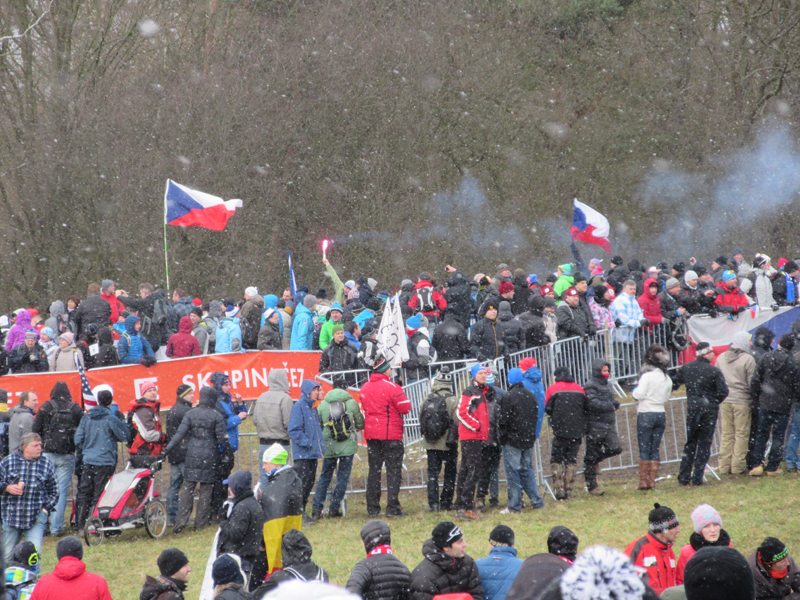 Last month I had the pleasure of attending the Cyclocross World Championships in Tabor, Czech Republic. I went to support JP and another Utah professional, Jamey Driscoll, who I have gotten to know over this past CX season. I travelled with Jamey’s girlfriend, Carly Clifton and fellow racer Annemarie White. Cori and I had spent numerous hours planning out all of the fun we would have together on this trip. I was excited to experience the races, and see some of Belgium as I grew up in a predominantly Belgian community in Mishawaka, Indiana. The Monday before the race Cori and I had one of the saddest conversations I have ever had. She had lost her pregnancy. It was heartbreaking to hear her sadness and how her whole family was struggling. If you have ever met the Page kids, you know they are the most polite and bright kids and not to mention incredibly adorable. It was sad to me to think that we would all not get to enjoy this precious little Page child. Now the race did not seem so important for me to attend. I was more concerned with all of them. By the end of the week, they decided they would make the trip to Tabor. After a thrilling private tour in Prague on Friday, the three of us girls drove down to Tabor to watch the first day of racing with the Women and Juniors race. We bought our tickets and I felt like I was a kid on Christmas morning. All of the fans, in their fan club gear, costumes, happy smiles, country flags waving…it was all what I had anticipated and more. We weren’t there more than 15 minutes when I saw JP taking a turn on the course in between races. I yelled to him and he pulled over and gave me a hug and thanked me for coming. I learned a lot about JP and his prerace regimen during this weekend and I think it might surprise you. Cori arranged for us to stay at this great farmhouse just outside of Tabor. When we arrived Cori was decorating a birthday cake for her youngest, Pearl, who turned 4 that day. Poor Cori looked so weak but she was determined to give Pearl a great birthday. We were joined by JP’s long time right-hand man, mechanic Franky Van Haesebrouke. It was clear to me that he is absolutely devoted to the Pages and truly a member of their family. 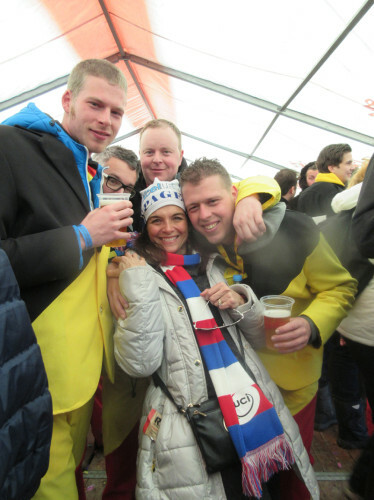 The Belgian tent hosted quite a party. Back to JP’s pre-race regimen…JP ate the same meal that the rest of us were served by the German couple who ran the Farm House, ham, potatoes and salad with a glass of wine. He also indulged in a piece of birthday cake. Nothing was going to stop him from being a part of his daughter’s day. After the party had died down, and Pearl had had her fill of cake and attention, we retired to our adjoining apartments where I found JP hard at work on the trainer and Cori just a few feet away from him. The morning of the race we all met for breakfast. JP, again, ate what was served to all of us. No special meals, no soigneur to give him massages, it is just Team Page, with Cori, the kids and Franky. I was grateful to be along for this ride. [Editor’s Note: JP has won the USA Cycling Cyclocross National Championship four times and finished second in the World Championships in 2007.]. We drove down to the course and found Jamey Driscoll. Jamey seemed relaxed and excited to be there. He was ready! 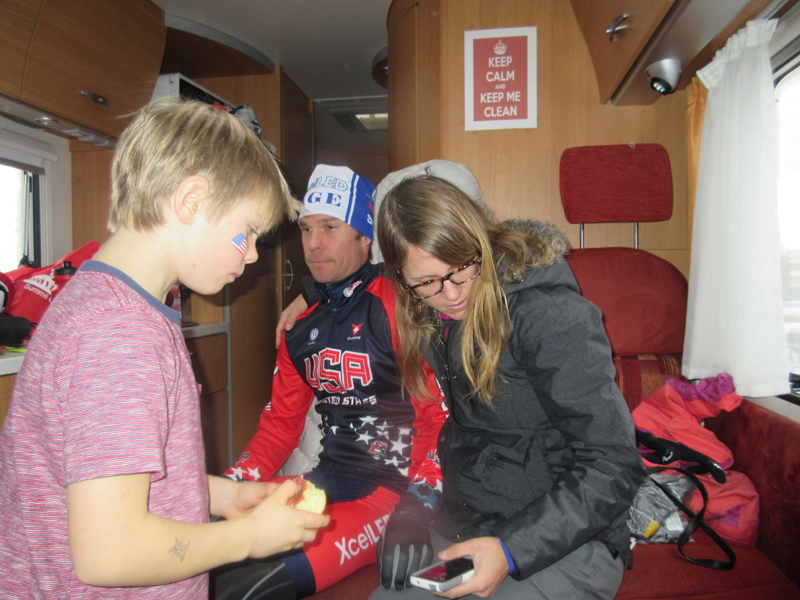 After an exciting Juniors Race I went up to the camper to check on Cori and kids. I found Cori resting and the kids playing around JP as he warmed up and worked on the bike. Franky was very focused making sure the Fuji bikes were perfect for JP. Every now and then he took a break to serve me a shot of some sort of green beverage…not sure what was in it but it did make the experience more fun! As the race got closer the kids started chanting “USA-ALL THE WAY” and “PAGE DESERVES TO BE ON STAGE”. I noticed as I sat on the couch that JP had etched in the window, “I (heart) Cori”, the kids and I set up with a bench along the far end of the course. I can’t explain the excitement. There are tents all over the course and the Belgians are easy to spot. They are singing loudly, dancing and of course pounding some beers. When my “Page” hat is noticed, immediately I am told that JP won the Silver Medal at worlds in 2007 and I am usually often offered a shot of “something”. JP has a very large fan base in Belgium. The announcing is fantastic. Everyone is cheering and anticipating the start of the race. I hear that the riders are off and just a short bit later I hear that Jamey Driscoll is running with his bike. I just feel so badly for him. After such a great season he got caught in a pile up at the start of the race. Shortly after we see the first wave of riders come through. As we first spy JP, he spies us and gives a big smile to Cori. He is happy to see her and that she is doing well. Not too much later I see Jamey flying by us. I would have never guessed he had several cracks in his humerus as fast as he was going. He looked strong and I know he would have had a great race had back luck not have struck him. JP had a bit of bad luck himself with a flat about half way through the race. At that point I believe he was in 14th. He still managed to finish in the top 25. That is pretty remarkable considering the emotionally exhausting week with no time on the bike until Friday he had experienced. After the race, we wait for JP and he is there just minutes after the race with a smile on his face and relieved that it is over and he can now just focus on his family. I feel very fortunate to have had this experience and have the honor to have shared it with such a cycling legend as JP and the rest of his team. I am already dreaming about going next year….who is with me? Editor’s Note: Jonathan Page finished 23rd in the 2015 World Cyclocross Championships while Jamey Driscoll finished in 50th place. Jonathan Page's main sponsors are Fuji, XcelLed, Lazer, Spy, Shimano, Sommerville, and Clifbar. Jamey Driscoll rides for Raleigh-Clement. You can follow Kristin at @bikerchickut on Twitter.